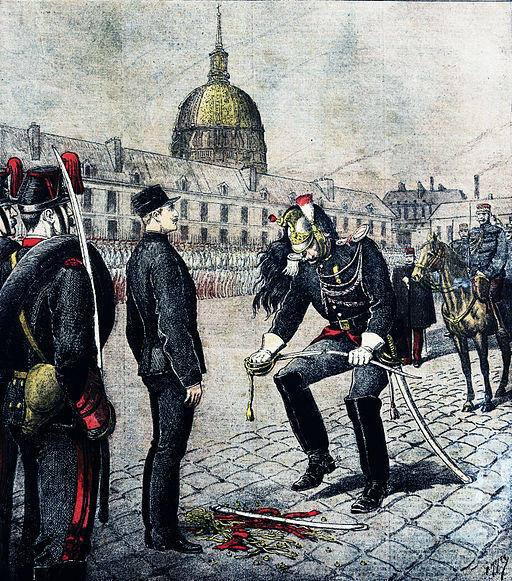 13th January 1898 was the day on which the Dreyfus affair erupted in France. One of France’s most respected writers, Emile Zola, published a letter on the front page of the daily newspaper “L’Aurore” with the headline “J’Accuse”. The accusation was that the leaders of the French army had falsely condemned an innocent man, and acquitted a guilty one, merely because the former was Jewish. The miscarriage of justice had arisen in 1894 when the Army’s General Staff became aware that they had a traitor in their midst who was offering confidential military documents to the German embassy. Suspicion fell on Captain Alfred Dreyfus, who was the only Jewish officer on the General Staff. The evidence against him was sketchy, amounting only to a supposed resemblance between his handwriting and that on a memo found by a French agent who was working as a cleaner at the German embassy. However, this was enough to send Dreyfus to prison at the notorious Devil’s Island in French Guiana, having previously been stripped of his military rank and had his sword broken in a public act of humiliation. In 1896, new evidence was found that pointed the finger of blame at another General Staff officer, Major Ferdinand Esterhazy, whose career had been far less distinguished than that of Dreyfus and who had been inveigled into spying for Germany due to his having squandered his money by gambling. However, the authorities refused to consider the new evidence, preferring to allow Dreyfus to continue to rot on Devil’s Island. Eventually, the lawyers supporting Dreyfus did manage to force the army to put Esterhazy on trial, and this took place, behind closed doors, on the 10th and 11th of January 1898. Esterhazy, a well-known anti-Semite, was acquitted, and this was what prompted Emile Zola to break the story to the wider public. The reaction of the authorities was to continue with the cover-up and to accuse Zola of committing a libel, of which he was found guilty. Dreyfus was, however, given a second trial but this also found him guilty, although his sentence was reduced from life imprisonment to ten years. The affair split French opinion down the middle, between the “Dreyfusards” and “anti-Dreyfusards”, with accusations flying in all directions, often fuelled by naked anti-Semitism on the part of the “antis”. It was not until 1906 that Esterhazy eventually admitted his guilt and Dreyfus was pardoned, having lived for twelve years under the cloud of having betrayed his country. Once pardoned, he was restored to the army and promoted to major. He was also awarded the Legion d’Honneur as some form of recompense. He served throughout World War I as a lieutenant-colonel and died at the age of 75 in 1935. The tragedy of the affair was the humiliation it caused for France in the eyes of the world, as it became abundantly clear that anti-Jewish sentiment was behind the whole affair. Had Dreyfus not been Jewish, the affair would never have occurred in the first place.